Front is a mix of vintage and modern fabric, with linen borders. Here’s the back using a favorite vintage sheet – it’s reversible! Here’s a new placemat I did using the Batting Buddy (tool reviewed on Ep 27). For this one, I added on two “wings” on the side to make it more of a rectangle. Here’s the birthday pennant I made – this sucker is hard to photograph! 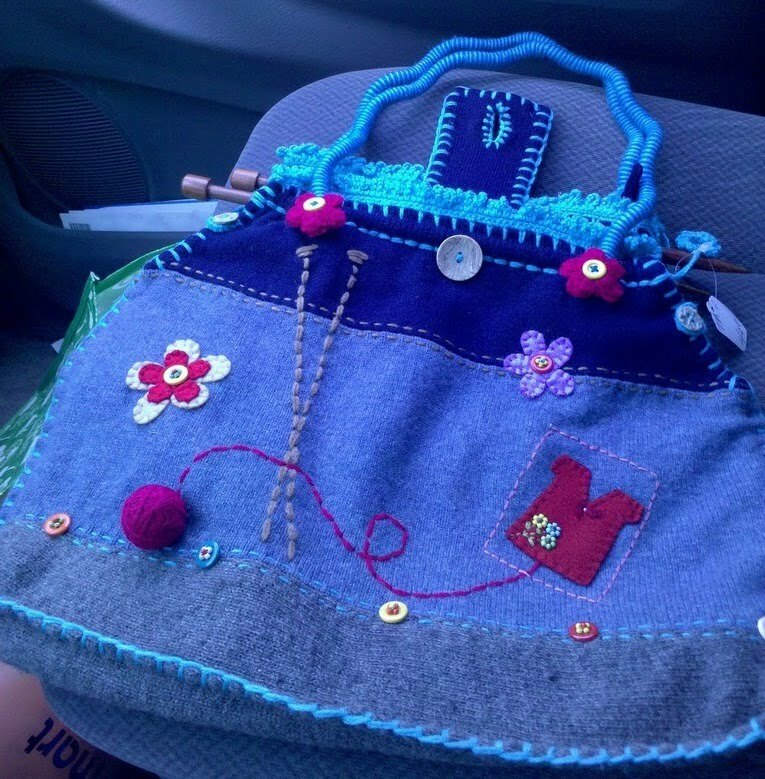 Check out Kelly’s great find at the Nearly New Sale – a Felted Sweater Purse for $4. It’s all 3-D and knitty fun. How in the world does one make handles like that? I have to know!!! Don’t forget about Special offer for listeners of Quilted Cupcake — You can get a free download of an audiobook by clicking on the link on my blog (see it over there on the right side?). Try the service for 14 days, if you don’t like it, you can cancel and owe nothing. You still get to keep the free book. be careful when trimming the “strings” -don’t cut the backing fabric, too. cut the backing fabric larger than the frame, then trim to size after you’ve trimmed the block. 5 Responses to "Quilted Placemats Episode 27 Show Notes"
Hi Jean, Great podcast. Placemats are a great idea. I’ll have to make some. Thanks for reviewig the batting buddy. I’ve never heard of it, but it definitely sounds like I need to check it out. Thanks! I’ve been trying to think of a design for one of those flag banners…inspired, YES! So cute! I love those blocks! Thank you for sharing your lovely blog, keep up the great work- we look forward to seeing more from you in the future! I make napkins to use at the table, which would go with your placemats. I make them the size of fat quarters so they really cover your lap and you don’t have to try and square them up. I put two right sides together and straight stitch around the edge, leaving a small opening to turn. After I turn the piece, I press and stitch around the edge again using a wide decorative stitch. Not only does it make a pretty finish, but it allowed me to try out different stitches. Jean – what a great episode! You are always such a delight to listen to and it’s nice to have a friend in the room while I’m sewing. Is it possible that your awesome place-mat includes a piece of fabric that I gave you? Batting Buddy. Intrigued, I am.